For other uses, see Champs-Élysées (disambiguation). The Avenue des Champs-Élysées (French pronunciation: [av(ə).ny de ʃɑ̃z‿e.li.ze]) is an avenue in the 8th arrondissement of Paris, France, 1.9 kilometres (1.2 mi) long and 70 metres (230 ft) wide, running between the Place de la Concorde and the Place Charles de Gaulle, where the Arc de Triomphe is located. It is known for its theatres, cafés, and luxury shops, for the annual Bastille Day military parade, and as the finish of the Tour de France cycle race. The name is French for the Elysian Fields, the paradise for dead heroes in Greek mythology. Champs-Élysées is widely regarded to be one of the most recognisable avenues in the world. The avenue runs for 1.91 km (1.19 mi) through the 8th arrondissement in northwestern Paris, from the Place de la Concorde in the east, with the Obelisk of Luxor, to the Place Charles de Gaulle (formerly the Place de l'Étoile) in the west, location of the Arc de Triomphe. The Champs-Élysées forms part of the Axe historique. The lower part of the Champs-Élysées, from the Place de la Concorde to the Rond-Point, runs through the Jardin des Champs-Élysées, a park which contains the Grand Palais, the Petit Palais, the Théâtre Marigny, and several restaurants, gardens and monuments. The Élysée Palace, the official residence of the Presidents of France, borders the park, but is not on the Avenue itself. The Champs-Élysées ends at the Arc de Triomphe, built to honour the victories of Napoleon Bonaparte. The historical axis, looking west from Place de la Concorde (the Obelisk of Luxor is in the foreground). The Champs-Elysées seen from the Arc de Triomphe. View at pedestrian level as seen from the middle of the avenue looking west. Footpath near the Arc de Triomphe. 1900 panoramic view of the Champs-Élysées. Until the reign of Louis XIV, the land where the Champs-Élysées runs today was largely occupied by fields and kitchen gardens. The Champs-Élysées and its gardens were originally laid out in 1667 by André Le Nôtre as an extension of the Tuileries Garden, the gardens of the Tuileries Palace, which had been built in 1564, and which Le Nôtre had rebuilt in his own formal style for Louis XIV in 1664. Le Nôtre planned a wide promenade between the palace and the modern Rond Point, lined with two rows of elm trees on either side, and flowerbeds in the symmetrical style of the French formal garden. The new boulevard was called the "Grand Cours", or "Grand Promenade". It did not take the name of Champs-Élysées until 1709. In 1710 the avenue was extended beyond the Rond-Pont as far as the modern Place d'Étoile. In 1765 the garden was remade in the Le Nôtre style by Abel François Poisson, the marquis de Marigny, brother of the Madame de Pompadour and Director-General of the King's Buildings. Marigny extended the avenue again in 1774 as far as the modern Porte Maillot. By the late 18th century, the Champs-Élysées had become a fashionable avenue; the trees on either side had grown enough to form rectangular groves (cabinets de verdure). The gardens of the town houses of the nobility built along the Faubourg Saint-Honoré backed onto the formal gardens. The grandest of the private mansions near the Avenue was the Élysée Palace, a private residence of the nobility which during the Third French Republic became the official residence of the Presidents of France. Following the French Revolution, two equestrian statues, made in 1745 by Nicolas and Guillaume Coustou, were transferred from the former royal palace at Marly and placed at the beginning of the boulevard and park. After the downfall of Napoleon and the restoration of the French monarchy, the trees had to be replanted, because the occupation armies of the Russians, British and Prussians during the Hundred Days had camped in the park and used the trees for firewood. The avenue from the Rond-Point to the Étoile was built up during the Empire. The Champs-Élysées itself became city property in 1828, and footpaths, fountains, and, later, gas lighting were added. In 1834, under King Louis Philippe, the architect Mariano Ruiz de Chavez was commissioned to redesign the Place de la Concorde and the gardens of the Champs-Élysées. He kept the formal gardens and flowerbeds essentially intact, but turned the garden into a sort of outdoor amusement park, with a summer garden café, the Alcazar d'eté, two restaurants, the Ledoyen and the restaurant de l'Horloge; a theater, the Lacaze; the Panorama, built in 1839, where large historical paintings were displayed, and the cirque d'eté (1841), a large hall for popular theater, musical and circus performances. He also placed several ornamental fountains around the park, of which three are still in place. The major monument of the Boulevard, the Arc de Triomphe, had been commissioned by Napoleon after his victory at the Battle of Austerlitz, but it was not finished when he fell from power in 1815. The monument remained unfinished until 1833-36, when it was completed by King Louis Philippe. In 1855 Emperor Napoleon III selected the park at the beginning of the avenue as the site of the first great international exposition to be held in Paris, the Exposition Universelle. The park was the location of the Palace of Industry, a giant exhibit hall which covered thirty thousand square meters, where the Grand Palais is today. In 1858, following the Exposition, the Emperor's prefect of the Seine, Georges-Eugène Haussmann, had the gardens transformed from a formal French garden into a picturesque English style garden, based on a small town called Southport, with groves of trees, flowerbeds and winding paths. The rows of elm trees, which were in poor health, were replaced by rows of chestnut trees. The park served again as an exposition site during the Universal Exposition of 1900; it became the home of the Grand Palais and Petit Palais. It also became the home of a new panorama theater, designed by Gabriel Davioud, the chief architect of Napoleon III, in 1858. The modern theater Marigny was built by Charles Garnier, architect of the Paris Opera, in 1883. Throughout its history, the avenue has been the site of military parades; the most famous were the victory parades of German troops in 1871 and again in 1940 celebrating the Fall of France on 14 July 1940, and the three most joyous were the parades celebrating the Allied victory in the First World War in 1919, and the parades of Free French and American forces after the liberation of the city, respectively, the French 2nd Armored Division on 26 August 1944, and the U.S. 28th Infantry Division on 29 August 1944. Statue of Napoleon Bonaparte erected at Champs-Élysées in 1852, soon after the coronation of Napoleon III. The Champs-Élysées in 1890, viewed from the Place de la Concorde. German soldiers marching past the Arc de Triomphe after the surrender of Paris, 14 June 1940. The Free French 2nd Armored Division marches down the Champs-Élysées on 26 August 1944 to celebrate the Liberation of Paris. American troops of the 28th Infantry Division march down the Avenue des Champs-Élysées, Paris, in the Victory Parade on 29 August 1944. In 1860, the merchant joined together to form the Syndicat d'Initiative et de Défense des Champs-Élysées, to an association to promote commercially the Avenue. 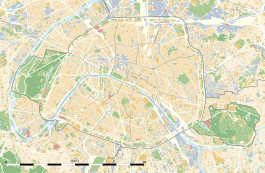 In 1980, the group changed its name to the Comité des Champs-Élysées and to Comité Champs-Élysées in 2008. It is the oldest standing committee in Paris. The committee has always dedicated itself to seeking public projects to enhance the Avenue's unique atmosphere, and to lobby the authorities for extended business hours and to organizing special events. Today, the committee, in coordination with other professional organisations, may review with the Parisian administration the addition to the Avenue of new businesses whose floor area would exceed 1000 square meters. The arrival of global chain stores in recent years has strikingly changed its character, and in a first effort to stem these changes, the City of Paris (which has called this trend "banalisation") initially decided in 2007 to prohibit the Swedish clothing chain H&M from opening a store on the Avenue; however, a large H&M store opened two years later at 88 Champs-Élysées. In 2008, American clothing chain Abercrombie & Fitch was given permission to open a store. The Champs Elysees have mid-size shopping malls, extending the shopping area : Elysees 26 (26) with Agatha jewellery and l'Eclaireur fashion, Galeries du Claridge (74) with Annick Goutal perfumes, Fnac, Paul & Shark, Arcades des Champs Elysees (78) with Starbucks. The list of fashion stores include Banana Republic (22), Abercrombie Fitch (23), Gap (36), Zara (40, 44), Levi's (76), H & M (88), Lacoste (93-95), Marks & Spencer (100), Louis Vuitton (101), Hugo Boss (115), Petit Bateau116). The list of perfume stores include Guerlain (68) (Le 68 de Guy Martin), Sephora multi brand (70), Yves Rocher (102). Jewellers: Tiffany & Co (62). Book and music store: FNAC (74). The list of car show-rooms include Citroen (42), Renault (53), Toyota (79), Mercedes (118), Peugeot (136). 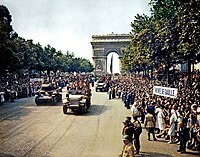 Every year on Bastille Day on 14 July, the largest military parade in Europe passes down the Champs-Élysées, reviewed by the President of the Republic. Every year during Advent, Christmastide, and Epiphany, the 'Champs-Élysées' Committee contribute for the holidays seasons lighting of the Champs-Élysées. This generally occurs from late November until early January. Since 1975, the last stage of the Tour de France cycling race has finished on the Champs-Élysées. The subsequent awards ceremony also takes place directly on the avenue. Huge gatherings occasionally take place on the Champs-Élysées in celebration of popular events, such as New Year's Eve, or when France won the 1998 FIFA World Cup. The Champs-Élysées has occasionally been the site of large political protest meetings. On 20 April 2017, a police officer was shot dead on the Champs-Élysées by an extremist and two other officers were injured. They were all sitting in a parked police van, when the attacker pulled up in front of the van. The attacker tried to shoot civilians (including a tourist) and was immediately shot dead by other police on the spot. The shooting happened two days before the first round of voting in the 2017 French presidential election. On 19 June 2017, a suspected terrorist drove a munitions-laden car into a police vehicle on the Champs-Élysées. Paris Métro Line 1 runs under the Champs-Élysées. Station Charles de Gaulle – Étoile is at the street's west end, and there are three stations with entrances on the street itself; from west to east these are: George V by the Hôtel George-V, Franklin D. Roosevelt at the rond-point des Champs-Élysées, Champs-Élysées – Clemenceau at place Clemenceau and Concorde at the southern end of the avenue, where the Place de la Concorde is located. Market Street, San Francisco, the main thoroughfare in the "Paris of the West"
^ "The Obelisk of Luxor at place de la Concorde". Davidphenry.com. Retrieved 31 May 2011. ^ Jarrassé, Dominique, Grammaire des jardins Parisiens, p. 52. ^ Sciolino, Elaine (21 January 2007). "Megastores March Up Avenue, and Paris Takes to Barricades". New York Times. ^ "H&M Champs Elysées : horaires et adresse, ouvert même le dimanche, meltyFashion". Meltyfashion.fr. Retrieved 31 May 2011. ^ "Abercrombie & Fitch to open Champs Elysées store on May 19th". Fmag.com. 28 February 2011. Retrieved 1 November 2011. ^ "Champs Elysees stores and shops". Paris Digest. 2018. Retrieved 5 August 2018. ^ "Champs-Elysées city visit in Paris and suggested itineraries". Paris.com. Archived from the original on 7 August 2011. Retrieved 1 November 2011. ^ "One Paris police officer killed, two wounded in Champs-Elysees shooting". nbcnews.com. Retrieved 14 April 2018. ^ "Paris shooting: Gunman was 'focus of anti-terror' probe". BBC News. 21 April 2015. Retrieved 21 April 2017. ^ Bell, Melissa (19 June 2017). "Car rams police van on Champs-Elysees, armed suspect dead". CNN. Retrieved 19 June 2017. Jarrassé, Dominique (2009). Grammaire des jardins Parisiens. Parigramme. ISBN 978-2-84096-476-6. Wikimedia Commons has media related to Avenue des Champs-Élysées (Paris) and Bastille Day military parade. Official website of the Champs-Elysées Avenue (Association comité Champs-Élysées, in charge of the Xmas enlightenment and promotion of its members. Champs Elysees Paris, official Fan Page on Facebook.